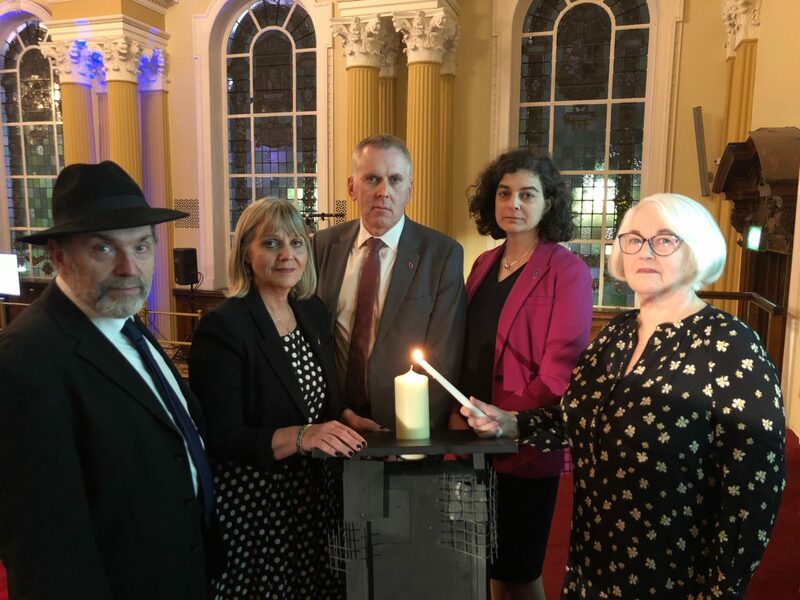 Holocaust Memorial Day Trust was pleased to partner with The Executive Office, Northern Ireland, who hosted a regional Ceremony on Thursday 24 January to mark Holocaust Memorial Day 2019. The welcome address was given by Councillor Deirdre Hargey, Lord Mayor of Belfast, and the keynote speaker was Olivia Marks-Woldman, Chief Executive of Holocaust Memorial Day Trust. A memorial candle was lit by Holocaust survivor, Joan Salter MBE, who was just three months old when her home country of Belgium was invaded by the Nazis. The Lowry String Quartet performed Ani Ma’ Amin, and Cantor Shulman sung Prayer Reading for the Repose of the Souls of the Departed, which was then read in English by Reverend David Kale. Closing reflections were given by Laura Marks OBE, Chair of Holocaust Memorial Day Trust. You can see the full ceremony in the below film.